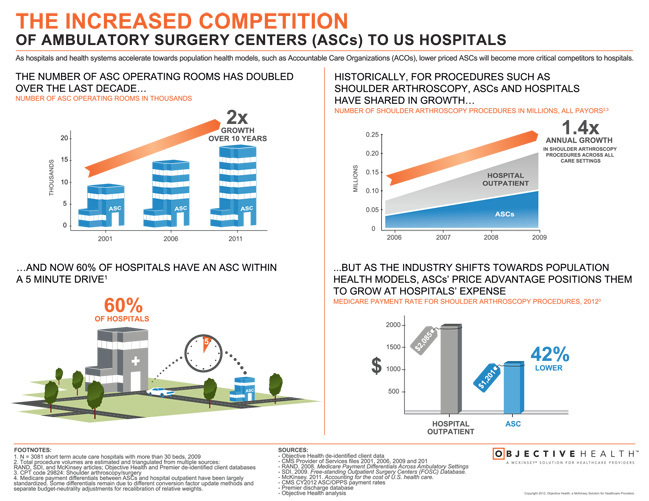 Over the last 10 years, Ambulatory Surgery Centers’ (ASCs) footprints have increased dramatically. As hospitals and health systems accelerate towards population health/ global payment models, such as Accountable Care Organizations (ACOs), lower priced ASCs will become more critical competitors to hospitals. I acquired the Certificate-of-Need [CON], co-founded and operated an ASC for 15 years before sale in 2000 to a public company. My local hospital fought me tooth and nail. I likely would not do so, again, today! Office-based outpatient surgeries (OBS) have significantly increased in recent years, with a growing number of specialists electing to perform surgeries in their own offices rather than at outpatient hospitals or ambulatory surgery centers. Popularity of OBS has been driven by the potential benefits to provider autonomy, however, commentators have expressed concern regarding the lack of regulation of the physician office setting. Physicians and practice managers are not ready to comply with a July 1 deadline for a new Medicare billing policy that would pay lower rates for certain office visits and other services in facility-owned physician practices, associations representing doctors and administrators have told government officials. Physician offices wholly owned or operated by hospitals will be required starting on that date to change their coding practices under a regulation from the Centers for Medicare & Medicaid Services. The policy requires a hospital and its entities providing outpatient services to coordinate billing efforts when patients are admitted to the hospital or soon afterward. Increasingly, larger corporations are sending employees and their family members needing hip and knee replacements to a handful of hospitals across the country that agree to a low, fixed rate for surgery and scored well on quality of care. As former President of a private ASC, I appreciate this effort. Internist David Judge, MD, of the Ambulatory Practice of the Future at Massachusetts General Hospital just spoke with Medical Economics about how the practice engages patients in an effort to improve care and contain costs. Doctor-owned hospitals are earning many of the largest bonuses from the federal health law’s new quality programs, even as the law halts their growth. The hospitals, many of which specialize in heart or orthopedic surgeries, have long drawn the ire of federal lawmakers and competitors. They say physicians often direct the best-insured and more lucrative cases to their own facilities, while leaving the most severely ill patients to others. When ASCs initially burst on the health care scene, the common practice was for providers to give up significant equity to ASC management and development companies in order to benefit from their expertise. In today’s market there is an abundance of ASC expertise; partners no longer need to sacrifice large equity positions to reap the benefits of a management and development company.